I still have purple on my mind, but because I don't have any purple shoes (darn it! I need to fix that asap!) I had to settle for purple tights. I bought some luscious colors from We Love Colors a while back but had yet to wear these yummy violet ones. I needed a purple fix. And I love all shades of purple with grey. They just play together so well. I wore a big snuggly grey cardigan from Target over a camisole. The skirt was my dressy denim Mizrahi, also from Target. The shoes are Report in grey patent. Well it was obviously all about the color! I had the tights but also remembered my pink and purple cameo necklace from Etsy. Love! So, as a temporary stop-gap this helped but not totally. I need more purple! I have a great royal purple cardigan which I think I need to replace soon. I'm worried I'm wearing it out! I just love how a design is reinterpreted by the designer to appeal to different audiences but then also to all the Brand to sell "exclusives" to a variety of stores. But then these lush peep-toes came out too. 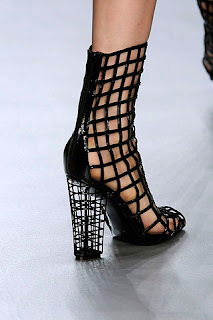 They remind me of my McQueen heels and I adore those. This color makes the style even more delectable. And today I saw the sandals created in flat version. Not that I wear flats a lot but these would great with an airy sundress or even a maxi-dress. Of the three I think I would have originally said the heeled sandal but now I love the peep-toe. And I was instantly in love with them and their colors. 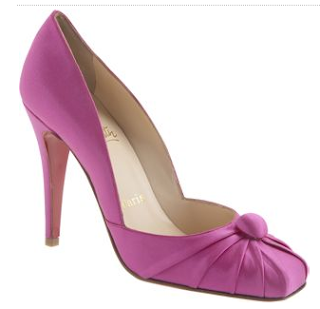 I start mentally thinking of shoes and outfits and decide I MUST HAVE purple/fuschia shoes. All I was doing was looking at some inexpensive tights and I get all worked up over regal heels! Bright flashy candy color... oh, and I need that skirt too! I was looking back on some older posts and realized I went through a bit of a grey suede phase there and then I was all over blue satin too. I think I just get a color stuck in my head and fall in love with it, obsessively search it out and can't get enough. Now I'm in love with purple/lavender/violet/fuschia heels. Not pink, because lord knows I have tons of pink (not that I'd turn more down! And, OMG! That list is from '97 and I know I have even more now!) And I realized, I don't think I have any shoes that are purple. I do have some with purple in them but no purple, no lavender, nothing! Can that really be true? So instead of opening up every shoe box to be sure, maybe I should just get some... ya know... just in case. I am currently smitten by all of these. I love the Sedaraby shape. It's a gorgeous shoe. But do I prefer Raspberry, above, or Purple? Do I love the Raspberry one because the color is called Raspberry? Is it too close in color to my Guess Pyramid heels? Maybe I should just start with Purple and then figure out a way to get the Raspberry too. Oh and did I mention I'd love to have these in white? I know I wrote about these before, but, I still can't get them out of my mind. Dammit! And now these. I adore these Viva Lolo heels. They're so adorable and have such a classy shape. The color is so unique. WANT! 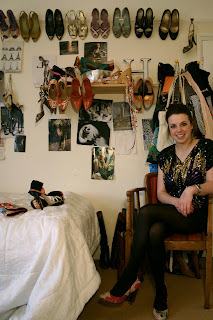 I am also seeing a growing obsession for deep peacock teal shoes too. I must be stopped! 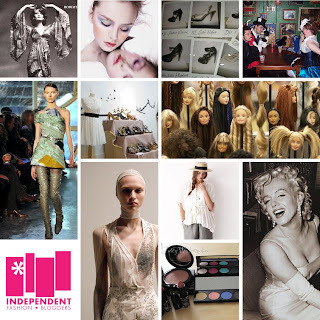 International Fashion Bloggers... seriously, some of the best, most insightful, honest and real fashion coverage out there! Couture Allure Vintage Fashion - Dressing the Best Actress Oscar nominees in vintage. dramatis personae - Laissez Les Bons Temps Rouler: Booze, Beads, & Costumes–Experiencing Mardi Gras like a Local. Egregiously yours - Spring look book, part one: chambray blue, luminous grey and crisp white. fashion in my eyes - Barbie all the way! fete a fete - shu uemura Spring Mirage mode makeup! 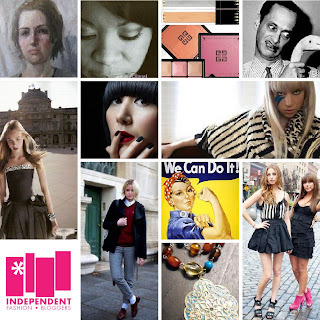 Independent Fashion Bloggers - PR: Frienemy or BFF? Shopping and Info - Shopping and Info found the English version of J Crew and loves the prices. Studio Purpura Fashion Blog - New York Fashion Week Fall 2009 - Rouge reds, Bold Metallic Colors and Fur! Style Symmetry - Who doesn’t love Marilyn Monroe? 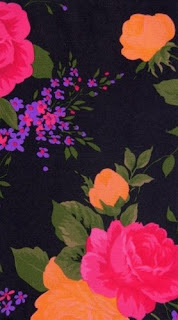 the musings of ondo lady - Lose yourself in Wanderland Boutique; the cool pop up store that is taking Manchester by storm. 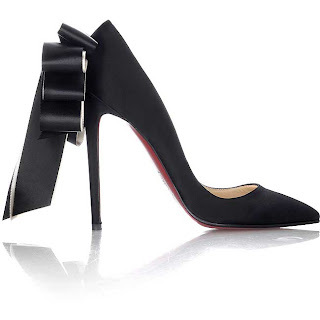 I just happened to be looking around the internets in search of a certain pair of Louboutins (don't glare at me like that I was just looking... I promise!) when I came upon this site called CLSell. I'm assuming that stands for Christian Louboutin sell because that is what they are claiming to sell. I say "claiming" because these shoes look nothing like real Louboutins to me. And it wasn't just the under $200 price tags that tipped me off either. Yes, that's right, they are selling these shoes for around $150 - $170. Which is absurd. Even sellers on eBay don't sell Louboutins, even used ones, for that little. The site was also very poorly written with some suspect language (we're talking poorly translated to English) and the names of the shoes are even wrong in some cases. But what jumped out at me immediately was the poor quality of these obvious imitators. I won't even give them the benefit of calling them knock-offs. 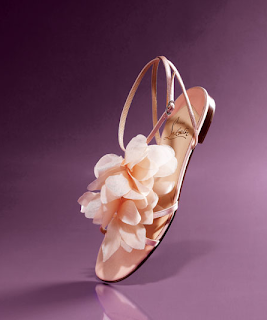 Two obvious examples are a pair of Anemone and a pair Bling Bling peep-toes. I just look at the pair above versus the real pair below and the materials are so obviously different and what is that under the heel? The differences are even more apparent with the Anemones. The shape of the top pair is very different, the ribbons are crap and I'm pretty sure these never came in this icky pink and white. 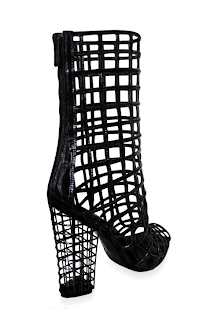 I guess if you really want the look, find the shoe too trendy or too pricey to buy the original these are a way to go. Personally I would bet they are poorly constructed, have lost subtle but essential design details that give the originals their elegance and will probably hurt your feet and only be worn once. I realized that I have been sadly lacking on talking about any thing I've been wearing lately. I can't believe I've let such an oversight happen! Frankly, I've just been swamped with work and outside activities - beekeeping classes, town stuff, bringing work home, taking days off to lobby at the state capitol, planning for new members of the family and looking into all kinds of trips around the globe. Plus trying to plan out more meals and I have at least three books I'm in the middle of. So to be totally slack, here is sample of outfits I've worn over the past few weeks. Each links back to the Polyvore page with details. And I have a ton more photos on Flickr. Some of these are representative pieces, so let me know if there is an item you have a question about. As you can see this sort of gets me through January. Maybe I'll catch up more over the weekend. By the way, I'm on Twitter all of the time. If you want to catch up with me there, I hope you send me a tweet! I admit that I need to broaden my horizons for my fashion choices but I just don't see how these could be attractive on anyone. They're definitely "interesting" and I see the style influences but they look very clumpy and clunky and uncomfortable and would just cut you leg off in some very unbecoming ways. Would you wear these? What would you wear with them? And would you pay over $400 for them? well, I think these fit the bill. 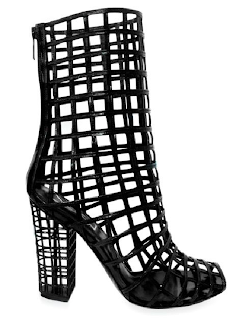 They are even more structural and Eiffel Tower-like than the Jil Sanders heels I was denied. When they were shown on the runway, they were paired some some amazing classic and artfully draped styles that contrast with the graphic nature of the boot. I love this. A slouchy dress that you could almost mimic with a big sweatshirt and jersey fabric skirt. And the simple knit top and pencil skirt in a very class taupe. If I do get these boots (ohhhh... I'm so tempted!) they will be a great conterpoint to my simple styles. Sorry I've been sort of slack around here! Today I was on the other side of the state for the HSUS Lobby Day. I went to talk to legislators about some new bills the Humane Society is trying to introduce in our state, mainly better regulations to prevent puppy mill and to get a mandatory limit on how long a dog can be chained outside. These are especially needed here in North Carolina because we have a huge issue with both of these issues and dog fighting too. In fact, just this week they were able to rescue over 300 pups from a horrible puppy mill situation. It was the first time I had done that, and while it was kind of stressful and tiring for me it was well well worth it! I'll be back soon with more "fun" stuff, I promise! 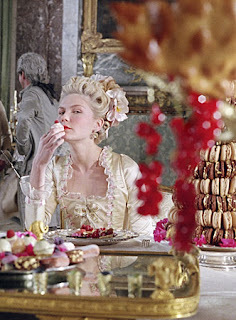 Everyone went absolutely ga-ga for the Sophia-envisioned Marie Antoinette movie. And who could blame them given unbelieveable-although-it-was-probably-this-excessive style of the wardrobes. 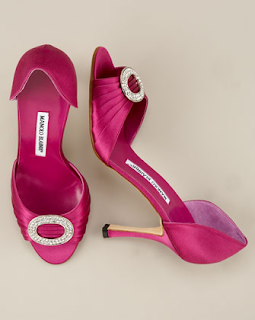 And then when our beloved Manolo did the shoes, well, that was the icing on the already big pink sugary cupcake. Not ot be outdone (although a bit late, perhaps?) Mnsr. 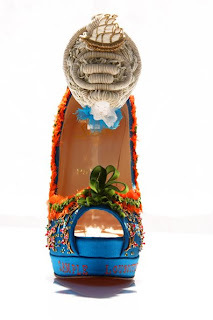 Louboutin has partnered with Jean-Francois Lesage of the famed French embroidery house Lesage to create a very limited shoe inspired by the queen. Look at the front of the ankle strap - it is Marie with her hair styled with a ship at full sail. 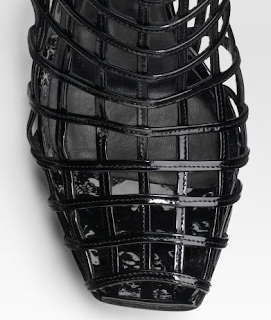 These are striking shoes and they should be with two artists working to create them. I love the yellow and blue but my heart is lost to the pink, of course. There will only be 36 pairs of the shoes made, and each pair will come in a specially created box. They will only be made in pink, yellow and blue. 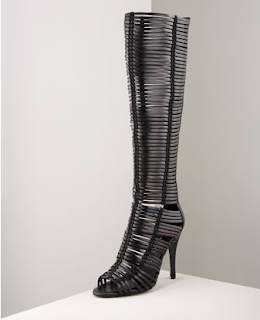 Oh, yes, and they are $6,295. But is that too much to pay for true art? I think not! 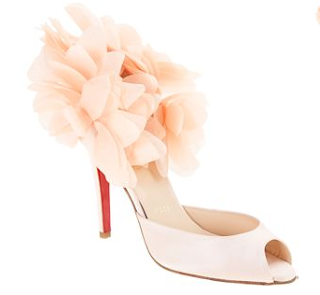 You can see them in person to get the full effect: on February 23rd these little treasures and the maestro behind them will be at the Christian Louboutin South Coast Plaza boutique and on February 26th they'll land in New York City, at the Madison Avenue boutique. In honor of the new addition to the family, Mr. Jake the Turkey, I thought we needed another Inspired by Nature segment. Isn't he just the most gorgeous thing ever? His plumage is unbelievable. Dusky blacks, soft browns, bright reds and blues and striking white accents. Gorgeous! These whipstitched Jimmy Choo sandals are a total match for the colors and accents. I love the chunky black straps of these Gucci Iman platform sandals with the banding and gold accents. 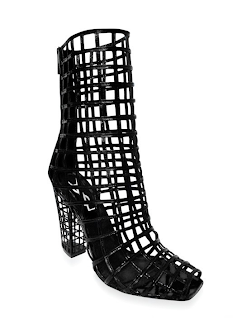 The black and white of these Sergio Rossi sandals remind me of the white feather stripes in Jake's tail and wings. And these Sigerson Morrison huarache boots on bare legs would give the same graphic stripe-y effect as his plumage and be just as attention-grabbing and striking. 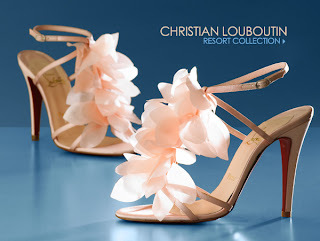 But my favorites are the Louboutin 123 double platform sandals. Not only are they just as graphic but you get that same pop of red! Perfect. This week on Links à la Mode we have an lots of lovely things… John Waters Inspiration from Mademoiselle Robot, Menswear inspiration from Solo Lisa, and if that’s too much man… 39thandbroadway contemplate equality in the fashion indsutry, and Or False Glitter talks about negative male perceptions on style… and Fete a Fete dishes out the new Spring colors from Givenchy, and reLYME dishes the new colors from Smashbox. 39thandbroadway.com - We are fierce, fabulous, fashionable women; now show us our freakin money! Calgary Fashion - Calgarian Up and Coming Designer raises the bar for Project Runway Canada contestants. Couture Allure - An open letter to Blumarine about body image in their advertising. féte à féte - Givenchy spring beauty colors! Iwanttowearit. - Karl and Katsyua Kamo rock the paper and scissors for the Chanel couture show. Arts and crafts never looked so glam! Or False Glitter - Pondering negative male perceptions of my style! reLYME - Smashbox’s new spring live brings out your inner muse. Shopping and Info - Shopping and Info found Angelina Jolie’s Hippie Chic black dress for Spring 2009. Style Symmetry - Eyeliah sits for 10 artists to paint her portrait… not naked! Style With Anna - Valentine’s Day Contest - Win This Fabulous Necklace! THE COVETED - Packing light for the compulsive over packer. the musings of ondo lady - Meet Chanel Ward, the fabulous blogger who brings us Hip Candy as well as six other blogs including Michele O. Style. When you're in the dead of winter you have dreams of spring to tide you over. Well, my dreams were for these quirky ballet-style wedges from Junko Shimada. Back in October, when I first saw them, I hoped that they would be made. I even spoke with the designer's representative in Paris. They were not sure if they would even be made but the possibility was there. Sadly, I just found out they will not be making them. I’m really sorry but these shoes are not available anywhere. They were too expensive to produce so we decided not to do it. We tried but we didn’t have enough orders. Maybe next collection shoes will be produced, we don’t know for the moment. Well, I guess I'll just have to be sad and disappointed. 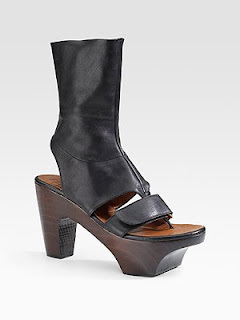 I think these were the one pair of shoes I really really wanted to get from this spring's lines. Wearing Your Heart On Your.... Shoes? I love Hetty Rose shoes. I mean, I really really LOVE them! 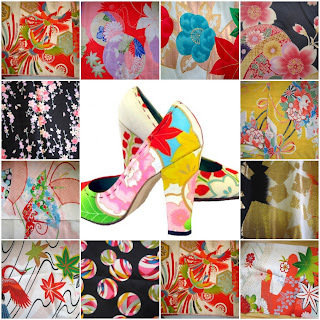 How could you not love such a talented person, who makes amazing custom shoes for you using gorgeous vintage fabric? Even better, Miss Hetty is offering up a special treat for Valentine's day. Hetty has made a limited number of real gold leaf Gift Vouchers which can be purchased by him for you, or you for you! See the Collections online here. Even better, get 10% off your valentine shoes! see voucher below. Perfect for a gift or to treat yourself! 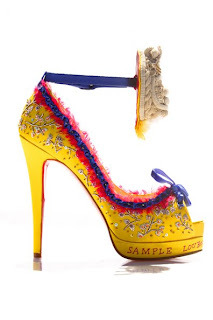 I think I'm going to wear my heart-bedecked Love shoes to skip around town in. Hearts with crystals and heart-shaped peep-toes? What's not to love?? ?